At Elixir we promote the anti-ageing properties of red wine – it is bursting with antioxidants, including resveratrol. But we thought the only way to sample its anti-ageing effects was to drink it! So you might perhaps understand my situation when I got to try vinotherapy for the first time. 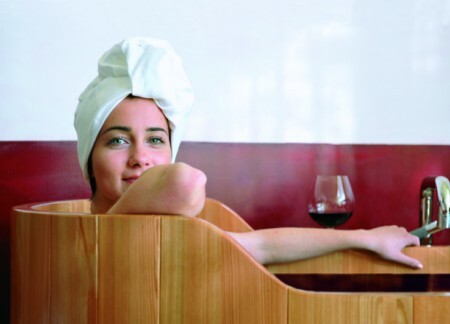 Following one of the best massages ever I was relaxing in the vinotherapy bath tub, containing what I assumed to be grape extracts when my spa therapist uncorked a perfectly good bottle of red wine and poured its contents into my bath. Seeing the look of pure horror on my face she relented and saved a glass, saying it wasn’t good to drink too much in the spa. So with glass in hand I not only tasted but relaxed and bathed in the revitalizing, antioxidant vapours of one of the finest wines of Torgiano – a pretty hilltop village in the heart of the famous DOC and DOCG wine region of Umbria. The Bellavue Winetherapy Spa is indeed a gem. 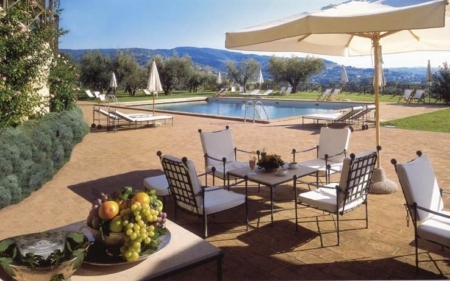 It is peaceful and beautiful, with indoor and outdoor pools, Turkish baths, a gym and outdoor relaxation areas surrounded by olive groves and views of the surrounding Umbrian Hills. The spa is in one of the region’s most exclusive five-star hotels, the Relais Hotel Le Tre Vasalle. The hotel was once a 17th century house, whose name refers to the ancient ceramic wine jugs, and is in a narrow street in what was once a fortified village in the Middle Ages, near Perugia (5 miles) and Assisi (10 miles). Surrounded by antique furniture and paintings, each of the 60 bedrooms is uniquely furnished, giving it has the feel of a grand country home – perfect for a romantic getaway. The restaurant, Le Melograine, reworks traditional Umbrian specialities such as pasta with black truffles, as well as diet menus served with delicious local wines. Le Tre Vassale brings together wine, art and hospitality. This is because the hotel is the passion of one family – the Lungarottis, first and second generation winemakers who have made Torgiano their own. The family has filled the town. As well as the hotel, there is a wine museum and olive oil, museum and the nearby Cantine Lunggarotti which produces the finest red wines grown on surrounding slopes (Sangiovese, Anaiolo, Merlot and Cabernet Sauvignon), including Rubesco. The whites (Trebiano, Grechetto, Chardonnay, Pinot) are grown on cooler hillsides. And there is also an excellent sparkling Lungarotti Brut made with Chardonnay and Pinot Noir. Giogrgio Lungarotti and his wife and Maria Grazia, an art historian run the winery business with daughters Chiara and Teresa and produce around three million bottles of wine annually. A visit to the Wine Museum and the Cantine are a must. Housed in the 17th century Palazzo Graziani-Baglioni, it has one of the most comprehensive collections of viniculture artifacts anywhere in the world – from its earliest beginnings in the Mediteranean to the Middle Ages and beyond – covering five thousand years of winemaking history. 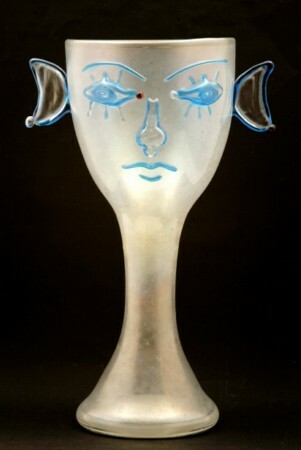 The theme of the wine god Bacchus runs through the collections which are housed in 20 rooms, featuring working tools, fine prints, drawings, antiquarian books and graphics by Picasso and a glass by Jean Cocteau (pictured below). The hotel offers a range of activities including truffle hunting, cookery classes, as well as scooter hire. I have always wanted to go truffle hunting. And it was not a disappointment.No need to get up at the crack of dawn.After a lazy breakfast we are driven to a nearby forest to meet our guide Matteo and his English setter Asia (pictured below). The black traffles, known locally as “black gold” can fetch up to 150 Euros a kilo and the rarer white 3,000 Euros so the cost of buying your truffle dog – 4,000 euros in the case of Asia can pay dividends. Asia was a star. She sniffed around for a few minutes, driven by a reward of a cheese slice each time she found a truffle. Sniffing the ground and as if by magic she would start digging with her paws, finding truffle after truffle. Standing on her back legs she put her front paws on Mateo’s hips to claim her reward. As we walked in the woods we passed groups riding horses – this is also riding country – people smile and wave at us. And back at the minibus we were greeted by table laden with a feast of antipasti and red wine – and it was only 10.30am! A bit early even for me but sometimes a girl has to do what a girl has to do! After all it would be rude not to! Double rooms from £194 ($297, €220), also look out for special packages and promotions on the website.